Did you realize there’s never been a better time in human history to make money from what you already know? It’s true! 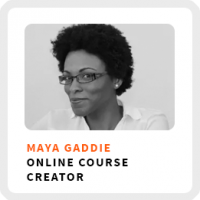 In this episode, I’m talking to Maya Gaddie who helps women design, launch and sell online courses or what she calls their signature program. This is one of those stories that shows you how all of your previous work experiences can come together to create a self-employment opportunity in alignment with your values, abilities and needs as was the case for Maya. When she was employed, she was creating online courses and programs for universities. When she started working on her own, she was a tech consultant for business owners helping them with their marketing and sales funnels. She rolled both of those work experiences together to start her latest business helping others design online courses. How Maya kept iterating to understand the services she wanted to sell as a consultant and coach that were in alignment with her values and abilities. The very first 3 steps you can take to start building your very own signature program. What gets people really stuck when they develop their first online course and how to avoid those mistakes. Core work habits: 1) Getting organized 1 day a week 2) Schedule downtime (takes Sundays off) 3) Focus only 1 task at a time. Ideal work environment: Needs movement by working in different places in her home. She even has a second desk in her house! Definition of success: Focus on happiness, joy, curiosity and monitoring her numbers. 90-day goal: Focused on her Digital VIP membership. Maya offers this advice for how to make time to start building your own online course. Schedule time that works for you to work on it. Even an extra hour each morning before work.